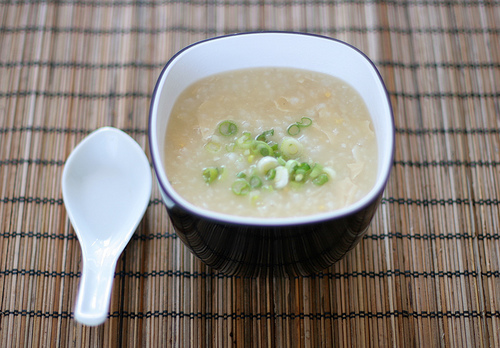 Savoury porridges – called congee – are widely eaten by the Chinese (and other Asians) for breakfast. In their plain, bland form, they are also given to the sick, the elderly and children. However, this humble peasant dish transforms itself into something altogether sexier when served with a variety of flavourful accessories. Here, the Malaysian-style congee is accompanied by traditional garnishes, but you can experiment and use any toppings you like – such as sautéed mushrooms, cooked red aduki or black soy beans, fried tofu pieces, and so on. Comfort food has never been more colourful. Serves 2. 1. Boil the stock in a large saucepan and add the rice, coconut milk, salt and sesame oil. 2. Bring the mixture back to the boil and stir. Lower the heat and simmer, covered, for 45 minutes until the rice is cooked and the mixture has thickened. Stir the porridge occasionally during the cooking process to prevent from sticking. Add more water if necessary – the porridge should have the consistency of custard. 3. Ladle the porridge into pasta bowls. Surround the bowls with the accessories in little individual dipping plates, and add them in according to taste.